Most people don’t normally give much thought to their kitchen sinks, unless they are backing up or leaking. In fact, when remodeling a kitchen, the sink is often the last consideration. But this workhorse of the kitchen gets used every day for meal prep and for cleaning up afterwards. Shouldn’t your sink be easy to use, hard to damage, and still add some eye appeal to your kitchen? Sometimes you have to replace a sink—when an enamel sink is severely damaged, or when any sink is leaking. And sometimes you’re just ready for a kitchen update. Having decided to install a new sink, you’ll first need to decide what type of sink you want. 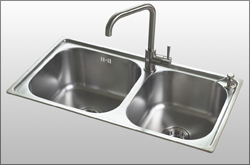 Stainless steel sinks are a popular choice, and often the least expensive option. They are the best choice for undermounting with granite or engineered stone counters, and are best for those who tend to carelessly toss dishes into the sink. They’re easy to clean, too, and they last a long time –15 years or more—without much marring. Worried that a steel sink will be too noisy? Look for one with sound-absorbing pads on the exterior bottom and sides; they really are quieter than standard steel sinks. They do add charm to a kitchen, and come in a number of colors. But enamel is prone to scratches, and shows wear with age. If you’re tough on sinks and tend to drop things, you may end up with a chipped or cracked surface; even a light, sharp knife can chip an enamel sink when dropped. And damaged enamel exposes the metal underneath, causing rust. 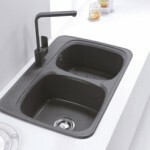 One of the newer styles of sink is the composite sink, made of acrylic blends and finished to look like enamel. Fairly inexpensive and available in a number of colors, they are the least durable of all sinks, prone to staining, scratching, and even melting if a hot pot is placed in the sink. Of course, when replacing the sink you’ll need to replace the faucets. Faucets serve a practical purpose, and you want one that reaches comfortably into the sink bowl, minimizing the splash and spray that come from a poorly placed, or too short, faucet arm. But faucets also add a touch of individual design to your sink area, so look for one that combines easy use and a design you like to look at. 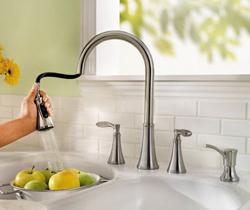 Single lever faucets generally work best in a kitchen, and one with a ceramic disk valve and sold brass base materials will be the most durable. Many of the newest faucets include a pull-down sprayer, but if that is not to your taste, be sure to include a separate sprayer. 1. Match your sink to your space, your needs and your budget. 2. Determine if you need an under-mount or top-mounted sink, as that will influence the style and material of your sink. Know how many holes you need for faucet, sprayer, etc. 3. Think about how you use it. Do you need two sink bowls for food prep or clean-up? Do you hand wash dishes, or use a dishwasher? If you cook and bake, do you want an extra large sink bowl –either single or double—to accommodate your large cookware? 4. Consider your height when selecting the bowl depth, which can run from 6-12 inches. Shorter individuals may not be comfortable having to reach into the bottom of a deep sink. 5. Your plumber should first measure the tailpiece of your sink and be sure there is room for new pipes; he should also be sure he provides a sink that covers the opening left from the old one. Don’t expect him to use your old drainpipes; a new one is easier to install and is far less likely to leak. 6. Make sure the plumber checks for water stains around the sink rim; severe swelling of the countertop will prevent the new sink from sitting flat, and crumbling particleboard will not securely hold the clips that fasten the sink to the countertop. Need more information about replacing your kitchen sink? Give Troudt Plumbing a call or contact us.